Fredrieka, tell your mom to ignore those piles and help you look for toys instead. Patrecia, I would probably dig up more rocks while I was trying to bury some. Then what would I do? I live in a rocky kind of place. 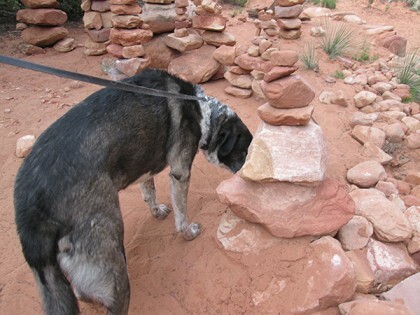 Pigs, there are rock piles on trails all over Sedona where I live. It’s kind of a New Age kind of thing but I don’t get it. I think we’re just fine in the old age. Oh wait, I get it now. If I got into the new age I wouldn’t be in old age and I could be young again. Maybe that’s why people build rock piles. So they can be young. Why are there so many rock piles anyway? I think we would knock some down too. 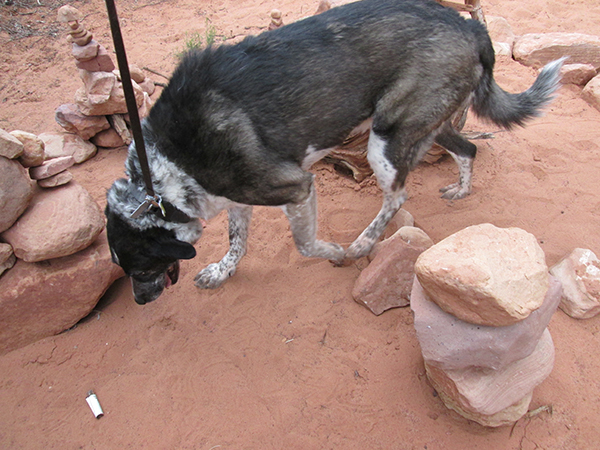 Lexie and Mica, rock piles show up on trails all over Sedona. Some New Age thing. It doesn’t make sense to me. More fun to knock them down. Lily & Edward, it must be from last time I was there. I forgot to leave a new message. I think knocking them down is a perfect thing to do! In gives people a chance to rebuild them and get young some more. FireBonnet, you’re right. I’m doing those people a favor. The rock piles on other parts of my trails where more people walk were always getting knocked down. I think that might be why the rock piles moved over near my wash. It must be my job to knock these rock piles down. Be careful, B. One of those stones might bean you in the head! Cupcake, they are pretty tall rock piles, aren’t they? Marina, it was even fun knocking those rock piles down. I think I’ll go knock down some more. I love how you are just always thinking of others!! Thanks Dalton. I bet those people were really happy when they found out they had more rocks to pile up. Hmmmm…weird, isn’t it? 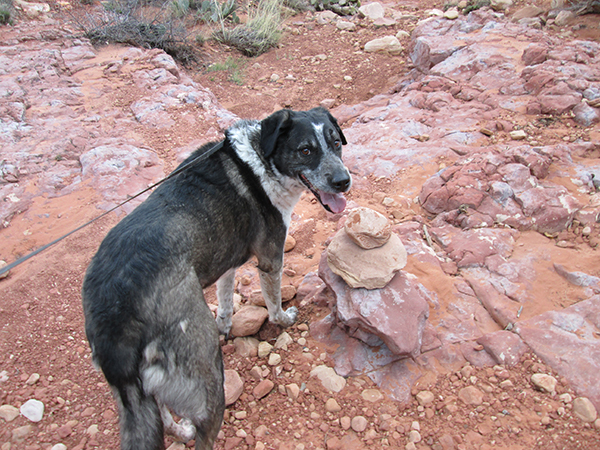 Those rock piles don’t have to be on your wash…where it’s your lovely place to play. Good idea to know them to the ground, Bogo…I’d love to help, but please be watch your head not to hit. Kevin, those tall piles really are kind of dangerous. I’ll make sure I avoid them it there’s a wind storm. I think those piles are showing up in my wash because they first started showing up on the part of my trails where lots of people and dogs walk and they were always knocked down in a couple days.